Chronilus is coming to Boomfest! 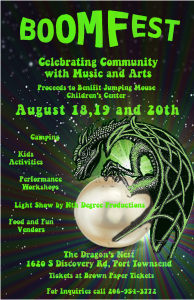 Chronilus will perform at Boomfest in Port Townsend, WA from 6:00 to 7:30 p.m. on Thursday, August 18! 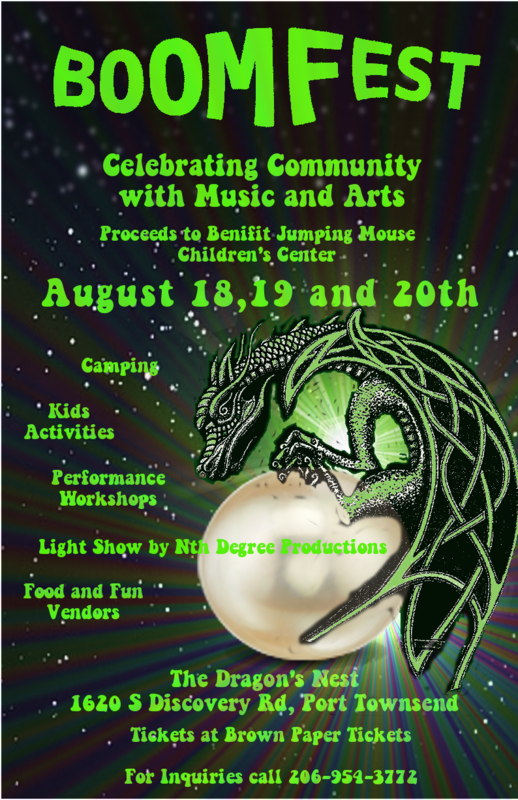 This is opening night of a fantastic weekend of live music, camping, art, workshops, and more. Here is the Boomfest Facebook page for the ticket link and details on the whole weekend festival. 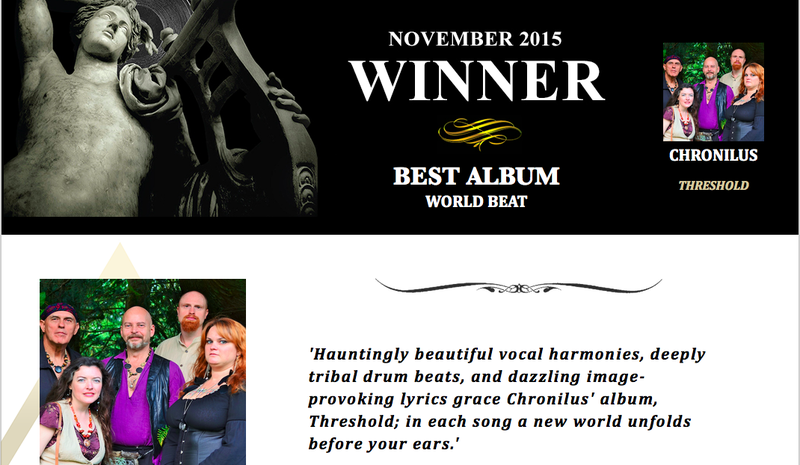 Chronilus chose Audio Logic Studio in Seattle as the place to bring real expertise and professionalism into the recording process for our 2013 EP, Prologue, and our first full-length album, Threshold, in the latter part of 2014. Jay Kenney’s engineering work at Audio Logic stood out to us on some of the best albums from the Bone Poets Orchestra, as well as the Blue Divide album from William Pint and Felicia Dale. We especially valued Jay’s keen ear for subtleties in acoustic instruments like the violin, hurdy gurdy and Irish whistle, because the Chronilus sound requires special attention to clarity on Caera’s Irish harp. That harp is not easy to mic, as our live engineers will attest. For Jay, this was just not a problem. The harp came out strong and gorgeous on the Threshold album. Chronilus also depends completely on analog hand drums and percussion such as chimes, deer toe rattles and rosewood tongue drums that give off a lot of overtones we want to make the most of. Jay nailed it all, just boom boom boom, one odd instrument after another, always right on the money with the first mic position and EQ treatment. Jay’s subwoofer plugin is the “secret sauce” on the Chronilus djembe sound. We love it. Jay’s command of acoustic instrument treatment allowed us to put our worries aside and focus on being musical in the moment. The environment in Audio Logic really does promote relaxation and absorption into one’s musicality. Jay’s skills see to it that there is no wasted time or squandering of attention on unproductive sidetracks, so the experience of recording there feels like it’s all about the flow of the music, unimpaired. The console room is so comfortable I have pictures of Caera napping on one of the comfy couches while the rest of us were working. For Chronilus, recording was the most productive and least stressful part of our year leading up to the Threshold release, thanks to Jay. Jay’s communication process with the band members during recording is just enough to maximize our potential and minimize his own intervention, so the band felt well served and well guided in just the right balance to get an end result we play to death in our own cars. We can’t seem to get sick of hearing ourselves. When a band doesn’t hate its own overplayed material despite the public’s generosity, something has been done really, really well. For that, we must thank Jay Kenney and Audio Logic Studio.